On this meta page I collect and sort references to documents about BSE, Scrapie and Creutzfeldt-Jakob-Disease in the internet, which can not be found on the scientific sites. Any notification of further links is welcome. Rinderwahnsinn - Durch die moderne Medizin erst gefährlich - A combination of published results proves, that the Creutzfeldt Jakob disease can develop and be infectious without a virus. Large amounts of infectious material from cow or sheep are necessary to make infections lethal, but blood or organs from sublethal infected man can cause deadly infections in recipients. Latest Figures Suggest Mixed Messages - UK beef market report from A.C. Nielsen company. 1.4 Million Households Have Stopped Buying Beef - UK beef market report from A.C. Nielsen company. Short Questions and Answers on: Human and Bovine Prion Diseases, Creutzfeldt-Jakob Disease (CJD)and Bovine Spongiform Encephalopathy (BSE) - by Dr. Kondi Wong. A single case of BSE in Denmark August 1992 - Short article by Susanne Ammendrup on the single imported BSE case in Denmark, and on Denmarks status as a BSE-free country. BSE, Creutzfeldt-Jakob & Co. oder: Ist Wahnsinn übertragbar? - Ein Artikel des Graduiertenkollegs über Prionkrankheiten, der leider nicht einmal den wahren Urheber der Prionhypothese kennt und die BSE-Seite von WDR-Quarks für eine der beiden wichtigsten im Internet hält. 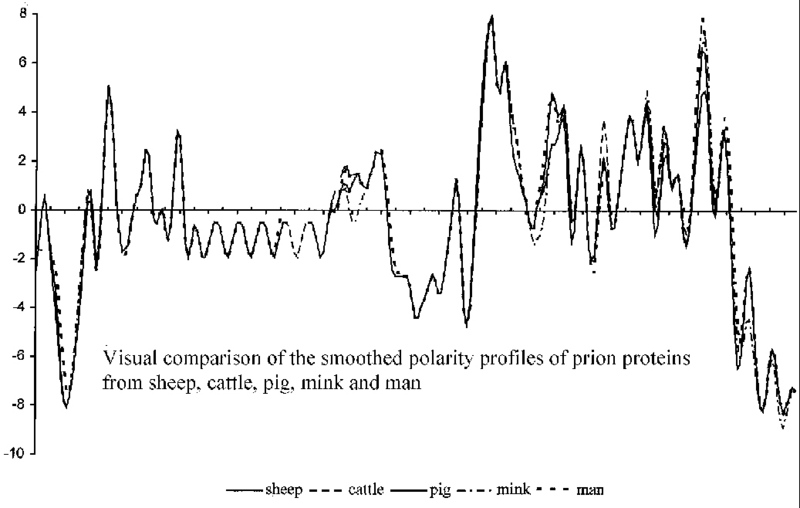 Scrapie/prion literature references Written and compiled by Chris Seidel. BSE and your health - Is British beef safe to eat? USDA, U.S. Public Health Service announce additional steps, support for industry efforts to keep U.S. free of BSE - Outline of additional voluntary steps taken by the US livestock industry and government support to ensure the US remains free of bSE. The steps include a voluntary ban on feeding ruminant-derived protein supplements to ruminants. Europeans at Risk from Mad Cow Disease - 10 August 1995 Viva! Europeans Also at Risk from Mad Cow Disease - 10 August 1995 Viva! A Joint Statement by National Livestock and Professional Animal Health Organizations regarding a Voluntary Ban on Ruminant Derived Protein Feed Recommended March 29, 1996 - The organizations include National Cattlemen's Beef Association, the American Sheep Industry Association, the National Milk Producers Federation, the American Veterinary Medical Association, the American Association of Bovine Practitioners and the American Association of Veterinary Medical Colleges. Rinderwahnsinn - längst in deutschen Landen? - Editorial von Udo Pollmer ohne Quellenangaben für die wie Tatsachen dargestellten Behauptungen. Besonders interessant wäre ein Beweis für das Märchen von den Prionen zerstörenden Lösungsmitteln. Cash for cows - Predictions that Britain's economy will be seriously damaged by the scare over mad-cow disease are exaggerated - Article from The Economist 30/3/96 Describes the economic impact of the recent events in the UK. Apocalypse maybe - Sometimes governments must respond to unknown probabilities of extremely unpleasant outcomes. Can economic theory help? - Article from The Economist 30/3/96 An example of using payoff matrices in economic decisions relating to agriculture. London Times articles on bSE. Scan the list of articles for Mad Cow Disease. You can also search to get some back issue articles. Genbank search - You can find many nucleic acid sequences by asking for "prion"
bSE Experts Response from Ralph Blanchfield of the UK Institute of Food Science & Tech. to a request on BSE-L for info on experts. Creutzfeldt-Jakob Disease and Hemophilia: Assessment of Risk - a review of Bruce Evatt, M.D.